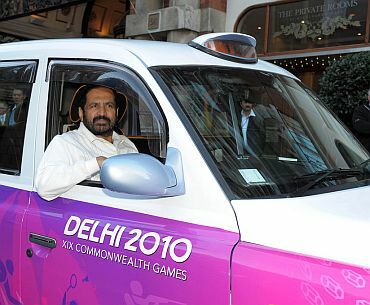 Sacked CWG Organising Committee Chief Suresh Kalmadi was on Monday arrested by the Central Bureau of Investigation on charges of cheating, conspiracy and corruption in connection with awarding some Games contracts. 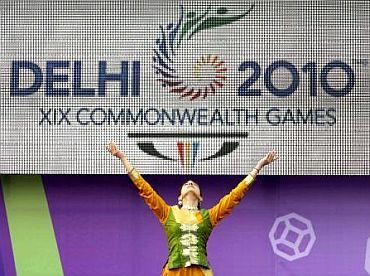 Six months after the end of the New Delhi Commonwealth Games that was mired in controversies and scams, the CBI finally closed in on 66-year-old Kalmadi, the CWG's public face, arresting him for allegedly awarding illegal contracts to a Swiss firm for Timing-Scoring-Result system for the Games, causing a loss of Rs 95 crore to the exchequer. A beleaguered Kalmadi's arrest was announced after his questioning at the CBI headquarters, his fourth since December last, over the alleged irregularities related to the award of contract to Swiss Timekeeping and the Queens Baton Relay. The agency also arrested two other OC officials Surjeet Lal, deputy director general (procurement) and A S V Prasad, joint director general (Sports) in the same case. Kalmadi, who came to the headquarters of the agency in Delhi in the morning, was arrested at 3.30 pm, a senior CBI official said. Kalmadi's arrest came weeks after his close aide and OC's Secretary General Lalit Bhanot and Director General V K Verma were arrested in connection with the same case. CBI officials said more arrests would take place in the case. Shortly after Kalmadi's arrest was announced, All India Congress Committee general secretary Janardhan Dwivedi said the Congress has suspended Kalmadi. "The disciplinary committee has suspended Suresh Kalmadi from the membership of the party," Dwivedi said. 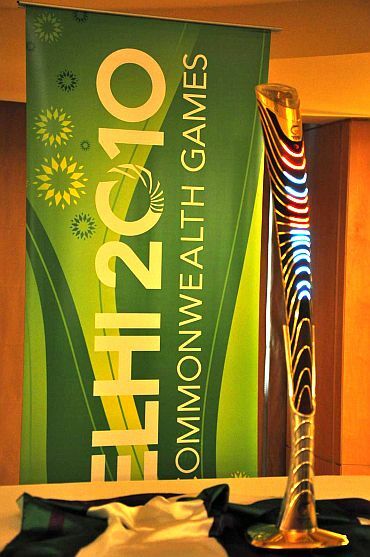 The CBI, in a statement, said, "The Central Bureau of Investigation has on Monday arrested the then Chairman of Organising Committee of Common Wealth Games-2010 for conspiracy to cause favour to a private firm based in Switzerland in awarding the contract for Timing, Scoring & Result system at an inflated cost of Rs 141 crore. In this connection, the then Secretary General and the then Director General of the Organising Committee had been arrested on 23rd March, 2011." The agency had asked Kalmadi, sacked as chairman of the CWG organising committee, to appear before it in order to clarify some new issues which surfaced during the visit of the agency's officials to London in connection with QBR scam. This was the fourth time he was asked to appear before the anti-corruption team. Kalmadi had earlier expressed his inability to appear before the CBI citing his foreign visit, saying he would return home only after April 19. But even after returning from his visit abroad, he did not turn up before the agency saying he was still not in Delhi. The CBI had gathered fresh leads after the trip of its two-member team to London in connection with cases related to alleged irregularities in hiring of AM Films and AM Car and Van Hire Limited during QBR held in 2009 at exorbitant rates, sources in the agency said. The team has spoken to the London-based owner of both the companies -- Ashish Patel -- who has provided information and documents with regard to the allegedly overvalued deal, the sources said. Allegedly, Kalmadi was paid 50,000 pounds as commission for expediting the release of the money to the firm (2,50,000 pounds). AM Car and Van Hire company in London was engaged during QBR in 2009 to provide services like taxis for the guests and OC members. The AM films was hired to provide display monitors during the event. The CBI team during their visit to London had also questioned other companies which were in the fray for the contract. The agency had sent a two-member team comprising Additional Director V K Gupta and DIG S K Palsania to London to probe the payments made to the two companies allegedly with Kalmadi's tacit approval, they said. CBI now wants Kalmadi to respond to the fresh information on the monetary transactions with the two companies. According to CBI sources, the agency had earlier pegged the CWG scam at around Rs 107 crore, but the figure is likely to go up. Kalmadi would also be charged with hatching criminal conspiracy for embezzling public funds, a source said. Reacting to questions that whether Kalmadi would be removed from the post of Indian Olympic Association chief, Sports Minister Ajay Maken said, "We are going to write to the IOA that they should elect a new president. The person who is in jail or who has been charge-sheeted, it would not be in the national interest that he should represent the country anymore. As soon as official confirmation of his arrest comes, we are going to request the IOA to elect someone." "We would also be writing to the attorney general seeking his legal advice. The government can also take action on its own if the IOA fails to take any action against him. If required, we will take action on our own," he added. Kalmadi and co miss another deadline. What a pity!